According to specialist literature, Kansas is a red, early-blooming peony. But we couldn’t disagree more. Kansas isn’t red at all! Just take a look at those lovely petals. Could it be any other colour than fuchsia? Also, it’s not an early-blooming peony in our opinion as it has a great deal of trouble opening at the start of peony season. No, Kansas is at its best mid to late-season. These misconceptions have resulted in a bit of an image problem for Kansas, as it has a reputation of being difficult to grow. And that’s a shame, because it’s a beautiful peony when grown with the proper care. Kansas is a double-flowered peony with flowers that bloom in the shape of a rose. The leaves are dark and the stems are red. The size of the buds won’t help you to determine the right time for harvesting though. Wait until the black bracts have fully opened up and the peony is fully fuchsia. Take it from us, it’s very important not to harvest this variety too soon. Kansas was registered in 1940 by American breeder Bigger. The variety was awarded the APS Gold Medal by the prestigious American Peony Society. We can’t think of any clearer proof of its beauty. 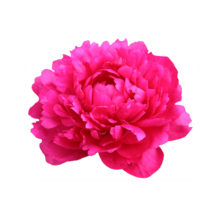 Only buy this peony when it’s showing colour. Check if the black bracts have fully opened up. The buds should feel soft when squeezed gently and you should be able have a little peek inside.